A murderer who was serving a minimum of 30 years in prison is on the run after two armed men helped him escape during an escorted hospital visit. Shaun Colin Walmsley, 28, fled from outside Aintree University Hospital as he was getting into a car with prison officers. Merseyside Police said two men believed to be armed with a gun and a knife, threatened the officers and demanded they release Walmsley, before making off in a gold-coloured Volvo. 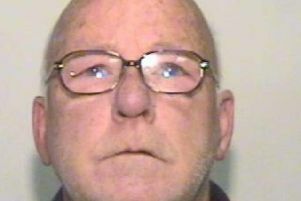 Walmsley was remanded in custody at HMP Liverpool after being sentenced to life imprisonment in June 2015, with a 30-year tariff, for the murder of Anthony Duffy. Neither of the prison guards were hurt during the incident that took place after Walmsley's appointment. Walmsley, of Wallace Street, Walton, is described as white, 6ft tall and of slim build with dark brown hair and blue eyes. He was last seen wearing dark bottoms and a dark jacket. The gunman is described as having his face covered and was wearing white shoes, grey tracksuit bottoms with a stripe down each side, a grey hoody and a dark coat. A manhunt is now under way and police are carrying out an extensive search of the area. The public are being warned not to approach the killer - described as dangerous - as he could also be in the company of the armed men who ambushed the car. An investigation into the full circumstances of the incident is ongoing and Merseyside Police is working with the Ministry of Justice and other forces across the country to establish Walmsley's whereabouts. Police are asking who has seen him, or knows where he is, to contact them on 999 or Crimestoppers, anonymously, on 0800 555 111.